How a small English town believed itself at war with Russia for a hundred years. In the poem above, I mentioned Berwick-upon-Tweed, or Berwick for short (it rhymes with Derek). Berwick is the most northerly town in England, two miles from the Scottish border. 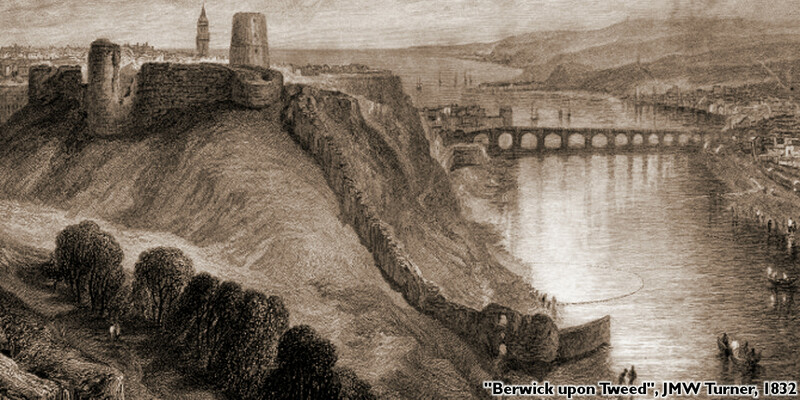 It stands at the mouth of the river Tweed, which divides Scotland from England in those parts, but Berwick is on the Scottish bank: for quite a bit of its history it was a very southerly town in Scotland instead. The town's football team still plays in the Scottish leagues instead of the English. Berwick has been in English hands since 1482, though given next month's referendum I'm not going to guess how long that will last. As befits such a frontier town, it's impressively fortified, and the castle and ramparts are well worth seeing. But today I particularly wanted to tell you about the story of its war with Russia. Fans of Jasper Fforde's Thursday Next series, and anyone who had to learn The Charge of the Light Brigade at school, will remember the Crimean War, a conflict which remained an infamous example of pointless waste of life until at least 1914. Now, because Berwick had changed hands between England and Scotland several times, it was once the rule that legal documents would mention both countries as "England, Scotland, and Berwick-upon-Tweed" to be on the safe side. And the story goes that when Britain declared war on Russia in 1853, it was in the name of England, Scotland, and Berwick-upon-Tweed, but the peace treaty in 1856 forgot to include Berwick, so this small town remained technically at war with Russia for over a century. In fact, the tale is untrue: Berwick wasn't mentioned in the declaration of war, as far as I know, though I admit I haven't been able to trace a copy— can any of you do any better? Such is the power of story that in 1966, with the Cold War becoming ever more tense, the town council decided that something had to be done about the problem. So the London correspondent of Pravda, one Oleg Orestov, travelled the 350 miles up to Berwick for peace talks, so that everyone could be sure that Berwick was not at war with the USSR. The mayor told Mr Orestov, "Please tell the Russian people through your newspaper that they can sleep peacefully in their beds."